Wow! 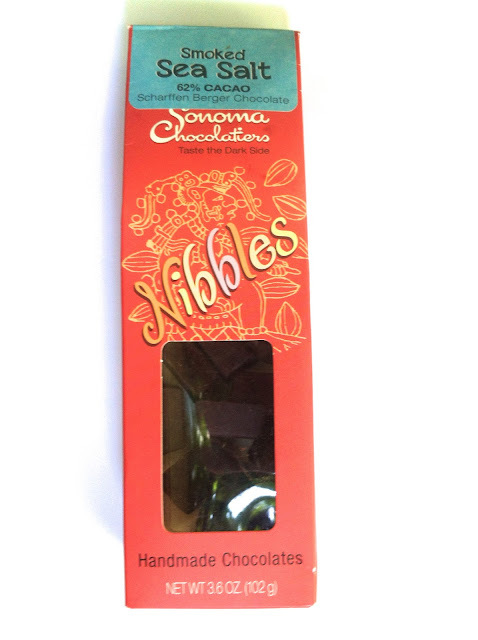 I love this trend of a tiny bit of salt mixed into a good chocolate bar. Sonoma Chocolatiers Smoked Sea Salt Nibbles, created from fine Scharffen Berger chocolate, are the best combination of chocolate with salt I've ever encountered. Mark tried, too, and seconds this emotion. 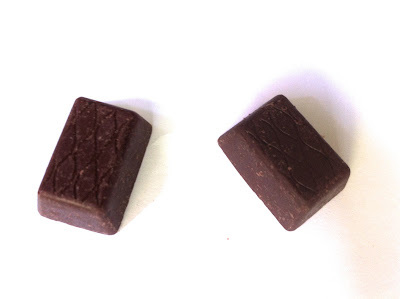 The bite-sized pieces of solid dark chocolate are already vaguely bitter in taste, with a small hint of sweet primarily hitting the taste buds at the end of the bite. The chunks of sea salt add a tiny bit of texture to the chocolate and also create these surprisingly moments where the flavor of the chocolate doesn't change as much as the tone of the chocolate. The salt somehow warms the flavor of the bitter chocolate, creating almost a savory chocolate blend that is both exquisite and unique. Thanks, Bernice!